Embracing strong over skinny, this rising powerlifter and overall badass has the world deadlift record in her sights! If you can't sit on an iron throne, the next best thing is to rip iron plates off the ground. Which is exactly what Amber Abweh, aka Swoleesi, is known for. Abweh bears a striking resemblance to the character Khaleesi from "Game of Thrones," played by actress Emilia Clarke. And Abweh has embraced her badass alter ego to become a recognizable force in the world of powerlifting. Strength wasn't always this flaxen maiden's goal, however. For a long time, the mother of draGAINS chased skinny legs and shredded abs. However, that pursuit left her wanting. "I was just so unhappy—all I cared about was having abs and being as tiny as possible," recalls Abweh. "And I didn't like how I looked or, more importantly, how I felt." Today, Abweh is an USPA International Elite powerlifter. She dominates in the 123-pound weight class and is aiming for the junior world record for the deadlift in the Anaheim Fit Expo in California at the end of August 2017. Her current PR is 402 pounds, a mere 5 pounds away from the record. With this smoldering deadlift workout, Abweh brings all the determination we've come to expect from the mother of draGAINS. To warm up her glutes for her heavy lifts, Abweh starts with a set of band walks. Using a heavy-duty Sling Shot band, she maintains constant tension in her glutes, hams, and quads by using a wide stance and a slight squat as she walks. The band walk develops strength and stability in the knees and hips to help with those heavy lifts—and is a killer warm-up for your deadlift-slaying routine! It's only natural to deadlift on deadlift day. By using a sumo stance, this pint-sized powerlifter easily conquers this king of lifts. "Most people don't know I'm a powerlifter because of how tiny I am," says Abweh. "I tell them how much I lift, and they're like, 'What?!'" The deadlift is a beast all on its own, but adding resistance bands to each side of the bar transforms this leg-day staple into a monster. Heavy bands add dynamic tension to the lift, increasing the resistance the further the weight rises from the ground. This added tension builds strength by challenging your muscles in a different way. Either option works for this exercise. If you choose to lift without the bands, load up 90 percent of your one-rep max and complete 5 sets of 2 reps. Using bands? Drop the weight to 70 percent and perform 10 sets of 1 rep. The pause deadlift is a favorite among lifting enthusiasts for reinforcing proper form and eliminating injury-causing momentum. To perform this move, lift the bar off the ground and immediately pause. Hover just above the ground and maintain proper alignment throughout the hold as you activate your glutes, before finally pulling the bar up. Abweh worked hard over the years to lift as heavy as she does, and she is not one to shy away from a heavy workout. For the pause deadlift, drop the weight to 75 percent of your one-rep max, and perform 4 sets of 4 reps, pausing each time you lift the bar before completing the movement. An exercise for only the bravest of gym warriors, the glute-ham raise challenges your fear of heights and your hamstrings in a single gravity-defying motion. If you don't have access to a GHD machine, you can use the seat of a lat pull-down or similar style machine and stabilize your ankles under the leg pad. When performing the glute-ham raise, maintain an upright posture with your hips in line with your shoulders and knees. Squeeze your glutes and activate your core to prevent bending at the hips as you lower your body. If you can't maintain this body alignment to come back up, place a box in front of you as a landing pad, allowing you to push off at the bottom of the rep. Complete 3 sets of 15 reps. In the video, Abweh forgoes the glute-ham raise in favor of single-leg Romanian deadlifts. This move offers a similar hinge at the hip but doesn't require the assistance of a machine. It's a perfect alternative if you have limited equipment available. Abweh is a fan of kettlebells, which she uses for added resistance to isolate her glutes during the Bulgarian split squat. She aims to build greater functional strength in her glutes, hamstrings, and core. Adopt a long enough stance that your front knee doesn't pass your toes when you squat. Keep your chest up and your back straight. Avoid the temptation to lean forward from the hips. An upright posture helps target those glutes and strengthen your core. Complete 3 sets of 15 reps on each side, holding the kettlebell in the hand opposite of the leg you're standing on. As Abweh demonstrates, you can steady yourself on the rack to help maintain form and isolate the correct muscles. Variations on the walking lunge are seemingly endless. Dumbbells, barbells, weighted vests, kettlebells—don't be afraid to dig into your bag of workout tricks for this exercise. Each tool has its subtle advantages. For example, balancing the barbell across your shoulders will help improve your core strength, while holding dumbbells at your sides improves your grip strength. To get the most benefit from this exercise and really build strength and power in the meat of your legs, maintain proper form and upright posture as you walk. Building strength is a source of pride for Abweh. "I want to show everyone that it's cool to be strong and it's cool to have muscle and strength, rather than just being tiny," she explains. "That's why I started powerlifting in the first place." Complete 3 sets of 16 walking lunges. An even number means each leg gets the same work. Grip strength is important for any serious lifter, and this forearm-killing exercise is the perfect finisher to an already-brutal workout. Abweh grabs a pair of 32-kilogram kettlebells for her carry—a cool 140 pounds total—and walks them the length of the gym to finish her workout. 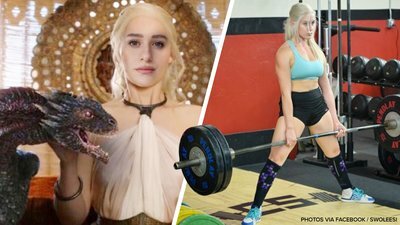 Abweh is proud of her choice to embrace powerlifting and her unmistakable resemblance to a famous badass female, Khaleesi, aka Daenerys Targaryen. "Swoleesi is like my alter ego," explains Abweh. "She is like the stronger version of who I am, a strong leader, and that's what I aspire to be. Maybe I can show that through my training." Walking the length of the gym and back.